Best way to make your holiday shopping stress free—shop local! Ditch the mall, the parking hassle, the crowds, and the grumpy sales associates and discover the friendliness of small business owners invested in their community. Check out some of these Lake Oswego spots that are dishing up service, unique offerings and lots of holiday cheer. Lucky Me Boutique. 385 1st St, Suite 115. 503.636.9595. Pandemonium Millinery seems to have a big account with Santa this year. The company’s scarves, hats, throws, gloves, and neck warmers are flying out the store. Why are they on everyone’s list? Owner Marie Lerud thinks it has to do with the fact that the faux fur is cuddly soft and the workmanship suggests these pieces cost more than they do. Lucky for you! Graham’s Book & Stationery. 460 Second St. 503.636.5676. During this time of year, Graham’s should add, “& Gifts” to their moniker. This is just a fun place to browse, knowing you will always walk away with something special for someone on your list. Owner Paul Graham is particularly excited about a new addition to their book collection devoted to our town. Lake Oswego – A Great Place to Live! is a photo expose/coffee style book filled with exquisite photos of the events, people, places and homes that make Lake Oswego unique along with descriptions and historical information that tells the rest of the story. Other fun gift ideas to add some surprise to your giving include:●the water-powered Bedol Water Clock, $24.99. That’s right—no batteries!●the Water Wizard, a laptop style drawing board that lets the artist use a water pen to create drawings that disappear as they dry, $16.95 ●The Elf on a Shelf, an interactive hide and seek tradition featuring an elf who keeps an eye on your kids by day and reports back to Santa by night. Each morning your children wake wondering, “Where will we find the elf today?” Comes with a book that tells his tale. $29.95. and ●Fusion Glass Side Tables, where art meets function, $99. Accessories From the Heart. 220 A Avenue, Suite 100. 503.675.1144. Owner Carol Winston is a woman on a mission—to make gift givers look good. She has done the hard part—tracking down the perfect gift. Now all you have to do is come in. Popular choices include Versace watches that start at $150 as well as a brand new jewelry line by Uno de 50 that features bold designs with a handcrafted look. Winston has the pajama market in town cornered with a good selection of PJ Salvage, known for its chic patterns and luxurious fabrics as well as Minnesota Softies by Paddi Murphy that offer not only cuddly comfort but also practicality for the woman who, as Winston describes, “experiences summer daily.” The moisture wicking fabric keeps you comfortable no matter what season or time of life you’re in. The store is happy to keep a wish list on file to make things easy for the Santa in your life and will wrap up your purchases free of charge. The Oilerie. 438 1st Street. 503.675.6457. 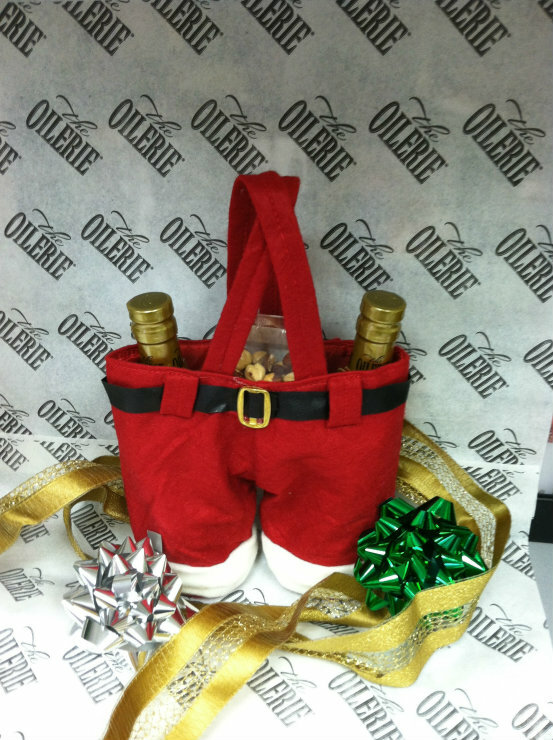 You know what they say, “It’s all in the presentation.” Well, pick up a festive pair of Santa Pants to hold your olive oil, vinegar and jar of spices from The Oilerie and you will have nailed your holiday gift on two counts—how it looks and what’s inside! This shop is as much fun for the buyer as the recipient because you get to sample and learn all about the delicious oils, vinegars, and marinades they carry. There’s a health and wellness line too, including a travel pack that makes a perfect stocking stuffer. The shop is happy to take care of your shipping (you can choose from one of their popular gift boxes or customize your own) but get your orders in by December 16. Soletta Shoe Boutique. 390 N. State St., Suite 116. 503.210.4125. Look no further for the fashionista on your list. Soletta has done the searching for you and brought in one-of-a-kind purses, jewelry, hats, gloves and festive socks (for men too) to complement their great selection of shoes and boots. 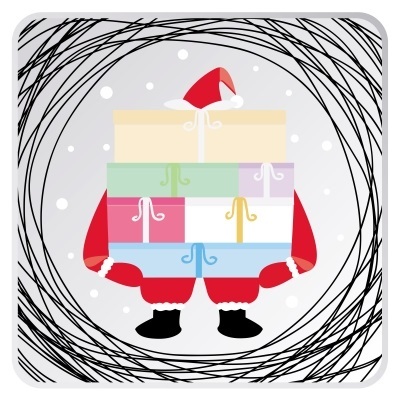 To make your shopping easier, they are happy to help you fill out a “wish list” that you can take with you or keep on file in the store in case a certain someone comes in wanting to shop for you. Gift certificates are also available. Visit during the week of December 16-20 for their “mystery sale” featuring 30% off a different section of the store everyday. Frog Pond Toys. 310 N. State St., Suite 102. 503.697.3764. The owners of this place are moms too so they know not only what kids like but what parents do too, meaning you’ll find toys that score high on safety as well as educational and play value. It’s like walking around in the Toy Hall of Fame with RingStix, winning the Best Toys for Kids award in 2013 from the American Specialty Toy Retailing Association and Tobble, a Parents Magazine Toy of the Year pick. Other popular choices include: Y’all Ball, Squigz, Snap Circuit Kits, Rody Horses, Bruder Trucks, Calico Critters, and Plus Plus, an interactive building system. The store is kid-friendly with room to roam and try out some of the toys, a café serving up lattes for moms, Goldfish crackers for kids, and special events including Music with Jodi on Friday, December 13 at 10:00 a.m. and a piano recital Sunday afternoon, December 15. Paper Caper. 16829 65th Avenue. 503.620.9460. Also known as Stocking Stuffer Central, you’ll find a huge assortment of gifts that put the merry in giving. Chat Packs feature 156 question cards designed to jumpstart the conversation from “What is one trip you have never taken but would really like to someday?” to “If you could be one inch tall for a day, what specific place would you most like to explore?” Flying wish paper brings a sense of ceremony to wish making as you write down your wishes on special paper, light them, and then watch them fly. Bacon lovers will get a kick out of bacon toothpaste, bacon soap, mints or jelly beans. Kids will love finger puppet books or pocket doodle books to keep them entertained. Part of the fun of shopping here is the element of surprise, so I’ll stop here and let you discover for yourself. Lake Oswego Library. 706 Fourth Street. 503. 636.7628. Looking for one more stocking stuffer or a unique way to wrap a gift? The Library has nifty reusable grocery bags and drawstring backpacks available for purchase for only $2 at the check-out desk. If you’ve got a local history buff in the family, another great gift idea is a copy of the hardbound book In Their Own Words, featuring oral history interviews of Lake Oswegans captured in the mid-1970s. $35 at the check-out desk. This entry was posted in Shopping in Lake Oswego Oregon and tagged Holiday shopping in Lake Oswego. Bookmark the permalink.